Data Warehouse Automation (DWA) is the most crucial part of our development strategy. In this BI4Dynamics BC (NAV) release, all SQL code is generated automatically. Any change to existing or new functionality is just one click away. We rebuilt the complete BI solution from scratch. A result in DWA edition is the same content as in our Standard edition that has been developed over the years. Now you can enjoy the best of both worlds: content and flexibility. Click to watch webinar recording on the Data Warehouse Automation. BI4Dynamics collects all AOT information about tables, enums and generates BI structures much faster and without errors. This significantly improves user’s productivity. Development is done through an intuitive user interface by selecting AX objects (tables, fields) and applying right names to BI objects (dimensions, measure). The rest is taken care by BI4Dynamics code generator. Sometimes it is necessary to add a specific SQL code into the existing script. This feature supports further DWA code generation of the same script and preserving manual code intact. Complete BI project documentation is generated with a click of a mouse. It includes details about architecture, formulas, hierarchies, as well as Top tables by size and Execution times of top procedures. BI4Dynamics latest release brings easy integration of external data sources into BI4Dynamics. Create SSIS packages to add any data source type (SQL, Excel, text, and other). Fine tune SQL scripts to fit BI4Dynamics Data Warehouse concept. 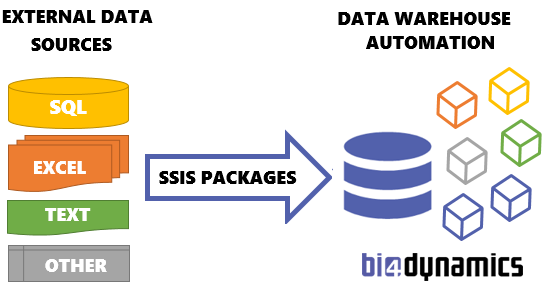 Add SSIS package to the BI4Dynamics process flow. Create a new cube based on tables from external data with the Wizard. Added integration of external data sources. Added management for deploying stage. Redesigned snapshot functionality for Sales and Purchase Orders. Added support for all data warehouse schemas. Added management of tables from external data source that don’t have CompanyID or primary key. Adding dimension Item Variant to Sales, Purchase and Inventory cube. Added attribute Posting description to dimensions to documents (Sales, Purchase, GL, Receivables, and Payables). GL cube: added dimensions VAT Business Posting Group, VAT Product Posting Group, General Posting Type. Sales cube: added dimensions Return Reason Code. Updated French and Spanish translations. Availability to add tables from Help, Setup, Dim, Fact and Metadata schemas (before Stage Schema was available to add) in Wizard functionality for building cubes and dimensions. Improved reading NAV objects in a multitenant environment. Stabilized SSIS process flow and SASS partition management. BI4Dynamics latest release brings Enterprise BI features with partition-based processing, editable process flow and other performance and development features. Partial data-based processing that enables up to 90% faster cube processing. Users can set 3 partitions – current, intermediate and archived. To support adding external data source BI4Dynamics process flow is flexible and enables adding new SSIS packages. Inventory state redesign: Measures are based on a data warehouse. Setup execution log: Monitor execution time and table inserts in Power BI. Folder translations: Translation option added to the Wizard. This release adds support for Microsoft Dynamics NAV 2018 (Application, Metadata, Multitenant). Built on latest .NET framework 4.7.1 to support latest Microsoft technologies. Added full support for SQL 2017. Added support for NAV 2018 (Application, Metadata, Multitenant). Added fully editable 12 dimensions (total 16): Business Unit, Currency, Customer, Fixed Asset, GL Account, Item, Job, Location, Reason Code, Resource, Resource Group, SalespersonPurchaser, Shipment Method, Shipping Agent, Source Code, Vendor. Added Filter on loading data into Fact (WHERE condition). Added Many-to-Many (dimension: measure group) relation in a cube. Create new or edit existing cubes, dimensions and measures through the simple 5 step process that is based on Metadata and supports the many-to-one concept (source-to-destination table). Create new cubes and data warehouse covering your specifics in Microsoft Dynamics NAV (or vertical BI solution) without prior SQL knowledge. Add fields to existing solution. Mix and match. Wizard or manual generated code. All inside one BI solution. Customization and development has never been easier. Corporate BI Solution for SMB price. Business Intelligence project is no longer reserved for companies with deep pockets. Get all information you need with BI4Dynamics Express. Connect Power BI and Excel reports to the ready-to-analyze data warehouse. BI4Dynamics Express uses the data warehouse to transform data from Microsoft Dynamics NAV to valuable information. This enables connecting to dashboards without affecting your Microsoft Dynamics. BI4Dynamics Express runs on SQL Server Express edition. This entry-level SQL edition is free and allows up to 10 GB database size. BI4Dynamics Express is available as an affordable subscription (renting). Users can choose 3 or (all) 6 modules from Sales, Receivables, Purchase, Payables, Inventory, and Finance application area. Where to download available resources? How to install BI4Dynamics Express? How to connect to predefined Power BI reports? How to connect to Excel reports? Our Complete Business Intelligence Solution is available during the trial period. We will guide you through the implementation of BI4Dynamics on your actual Microsoft Dynamics Data with full support at no cost. After installing BI4Dynamics, your data will continuously be transformed into relevant information. Thereafter, we will connect your data to Excel and Power BI reports and assist you with evaluating, analyzing, and monitoring your data.